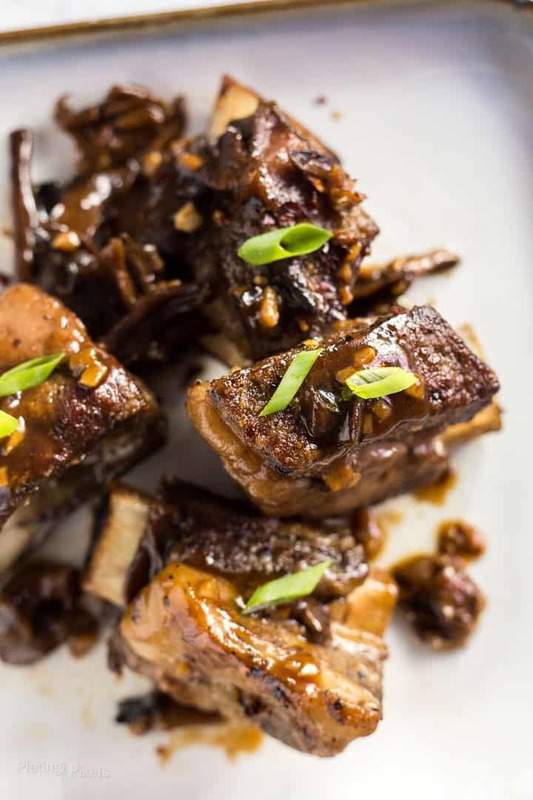 Learn how to slow cook Korean Beef Short ribs the easy way. Slow cooker short ribs are guaranteed juicy and fall off the bone. Plus you’ll make a sweet and sticky gluten-free Asian sauce to smother them in. It’s finger-licking good. Slow cooking is one of my favorite methods of cooking, any time of year. 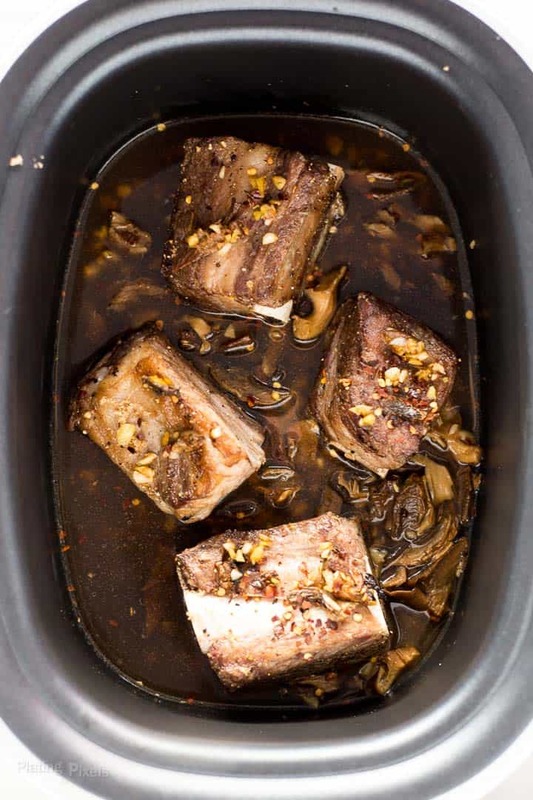 Normally saved for cooler weather and comfort food, the ease and convenience make it a preferred choice for all sorts of meats and recipes, including these Slow Cooker Short Ribs with Korean Sauce. Set and forget: Once you’ve added all the ingredients, simply set to cook. It can’t get easier than that. Start ahead and come home to a ready-cooked dinner: Start these in the morning before work or on a weekend, then come home to a fully cooked meal. Anyone can cook short ribs perfectly: There’s no risk of drying out, burning or undercooking with slow cooking. 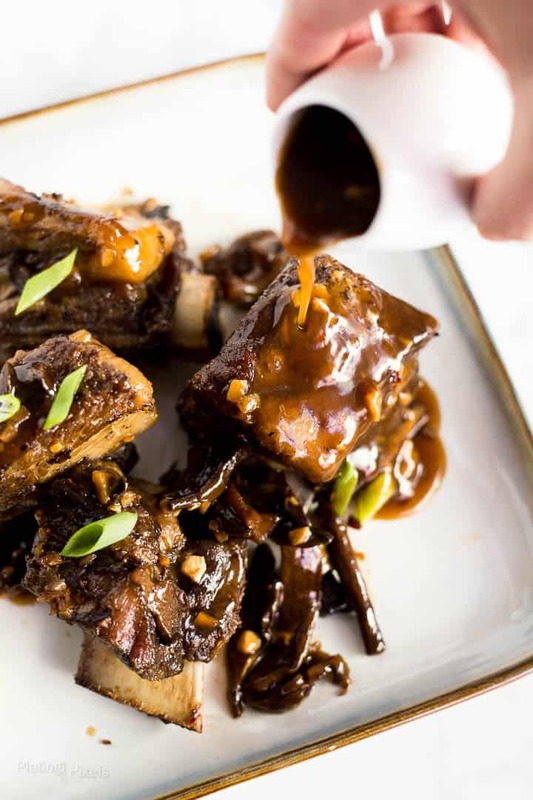 Fall-of-the-bone texture: Slow cooking short ribs guarantees moist and juicy ribs that fall off the bone. Sprinkle all sides of ribs with salt and pepper. Heat 1-tablespoon of oil in a large skillet or pan over medium-high heat. Add ribs and cook each side 1-2 minutes, or until browned. Remove from heat and place ribs in a slow cooker. It’s best to brown meat before slow cooking for added flavor and better texture. Since slow cooking doesn’t use high heat, it won’t brown the meat while cooking. 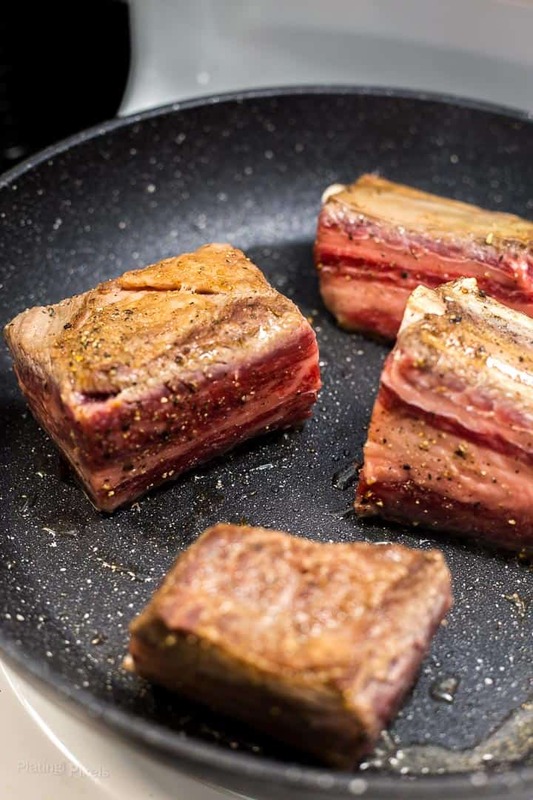 Browning the short ribs will caramelize the meat proteins and add a bit of firm texture to the flaky, tender meat. It also leaves little bits and oils in the pan which help flavor the sauce. These tips will help when browing meat. If you prefer another sauce, try my Carolina Style Grilled Baby Back Ribs that are slow cooked, then grilled for a smoky flavor. Should I use boneless or bone-in ribs? You could use either for this recipe. Bone-in will be juicier and are more fun to eat in my opinion. Boneless ribs will provide more meat if you want to make a larger batch. The cooking time is the same for either. 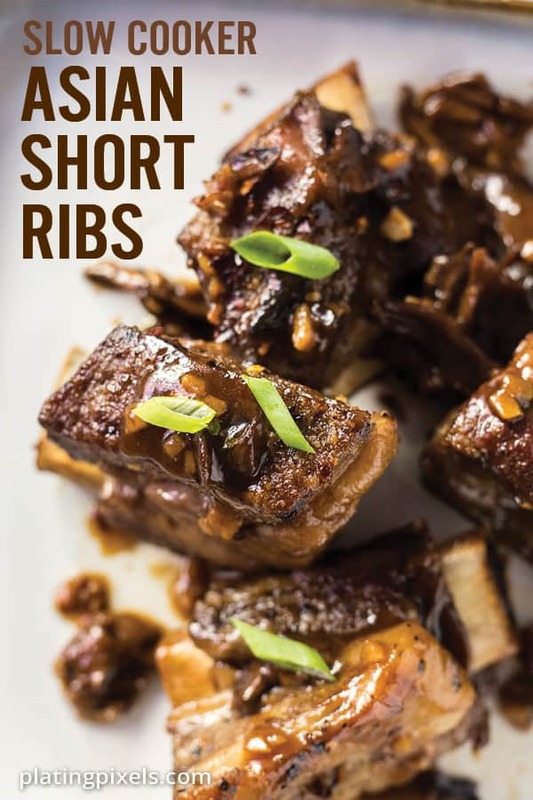 How long to slow cook ribs? In a covered slow cooker, cook ribs on HIGH for 4 hours or LOW for 8 hours for best flavor and fall off the bone meat. Flakier meats such as carnitas can benefit from longer cooking, but short ribs will become too tender. You want ribs that are soft enough to fall off the bone when eating, but stay on the bone until ready to serve. Can you slow cook frozen short ribs? It’s not recommended to cook frozen ribs. It is possible if you add an extra couple hours of cooking time, but the gradual temperature change can increase the risk of bacteria. It also makes it difficult to pre-brown the meat, which will give you much better flavor and texture. Instead, plan ahead and defrost ribs at least 1-2 days before slow cooking. Depending on how much moisture is held in the slow cooker, as well as the amount of moisture in the ribs to start, you may need to thin or thicken the sauce. To thicken sauce: Mix a bit of cornstarch (about 1-teaspoon) with water, stir into sauce, and heat over medium heat. Stir constantly until it reaches a low boil and thickens. To thin the sauce: Add more beef stock, 1-tablespoon at a time. Stir in until the desired consistency is reached. Slow cooker short ribs are easy, juicy, and fall off the bone. Smothered in a homemade sweet and sticky Korean sauce. Sprinkle all sides of ribs with salt and pepper. Heat 1-tablespoon of sesame oil in a large skillet or pan over medium-high heat. Add ribs and cook each side 1-2 minutes, or until browned. Remove from heat and place ribs in a slow cooker. Do not discard bits in the pan. Place remaining sesame oil in pan and heat to medium. Stir in mushrooms, garlic, and ginger. Cook 3-5 minutes, until fragrant. Transfer mixture to slow cooker. In a medium bowl, stir together beef stock, brown sugar, vinegar, soy sauce, and red pepper. Slowly pour over ribs in the slow cooker. Cover and cook on HIGH for 4 hours or LOW for 8 hours. Place ribs on a plate and cover with foil. To make Korean short rib sauce: Pour leftover liquid from slow cooker in a small saucepan. Stir together cornstarch with 1-tablespoon of water, then stir into pan. Cook over medium, stirring constantly until it reaches a low boil and thickens. 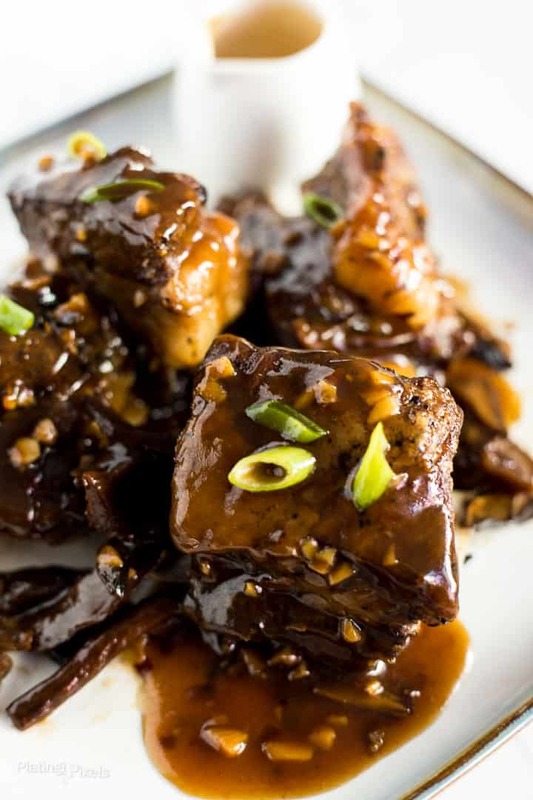 Pour sauce over ribs and serve garnished with sesame seeds and green onion slices. To save time or clean-up you could skip pre-browning the meat, but it's not recommended. Browning meat before slow cooking creates better texture on the outside and adds flavor to the sauce. Use liquid aminos instead of soy sauce for gluten-free. Fresh shiitake mushrooms are usually available at health-food or Asian grocery stores. Or you can find dried shiitake mushrooms online. Place dried mushrooms in a bowl of hot water to soften before using. If you can’t find shiitake mushrooms, sub with cremini mushrooms. However, the flavor will be slightly different. Slow cook ribs at recommended times. Too little and they won’t be tender enough, too long and they can fall of the bone before serving. If sauce is too thin, add more corntstarch. If sauce is too thick, add more beef stock. Recipe adapted from Cooking Light magazine. Print, 2018.